Warning: This is more of a rambling brain-dump than a carefully revised and edited, or even coherent post. 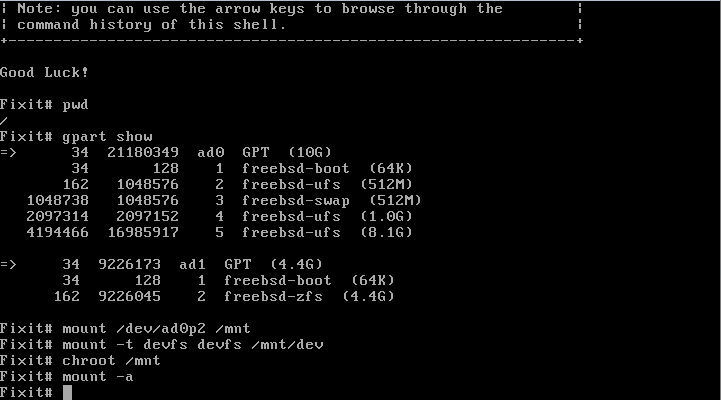 For a long time now, I've been intrigued by two useful features of FreeBSD: nanoBSD and ZFS. I like the nanoBSD concept of managing servers as deployable read-only images on ping-pong partitions. That would allow me to build and test an OS/application image and then push it over the network to a remote server without having to go through the mergemaster hassle. It also provides for an instant failsafe in case the upgrade fails. I've been using ZFS on production servers for about 2 years now. I like that it can tolerate unexpected power interruptions and that I can snapshot file systems before attempting risky modifications. The ability to back-out of bad upgrades can spare me long weekends and trips to a remote site. Over the years and in the back of my mind, I've been searching for a way to meld the characteristics of nanoBSD and ZFS to create an extremely reliable server able to tolerate far less than ideal environments and also easy to maintain remotely (including OS upgrades). In the worst case, I'd like to have the option of walking somebody through booting a recovery image over the phone so I can finish the job remotely. The problem with ZFS by itself for purely remote administration manifests when it comes time for an OS upgrade. Snapshots make it possible to roll back, but you still need a reboot to single-user mode and other risky business in order to complete the upgrade itself. It also takes a considerable amount of time (I like to build from source to apply custom build and configuration options). The problem with nanoBSD for a regular server is that /var is a memory disk and nothing stored there will persist across a reboot. Gone will be the logs, databases, mail, and other important things. There are some simple ways to work around this, but I want complete separation of the OS media and the data/configuration media. I'd really like to have a read-only OS image on one device with ping-pong binary upgrades and all the configuration and data on a raidz pool that's backed-up to another machine using dirvish or rsnapshot. I think it's cleaner to separate the configuration and data from the OS and installed software. Data and configuration can be on a raidz pool while the operating system and applications are static and could reside on a separate disk, compact flash, USB drive, CD-ROM, etc. Should the OS media fail, I want the system to automagically revive itself after replacement of a new OS drive without reconfiguration or restoration from backup. I've considered the idea of updating the applications separately from the OS (something like GoboLinux), but I think that is more trouble than it's worth. Libraries, applications, and OS are all tied together and it makes more sense to rev a single image where libraries applications and OS are compatible rather than try to maintain separate applications and OS and track a compatibility matrix. My plan is to start with nanoBSD and add a zfs pool with file systems and mount points at /cfg and /var. I'll symlink a directory like /etc/local to /usr/local/etc so I can store /usr/local/etc config data in /cfg along with the /etc data. If the zfs pool is unavailable, there will be a fallback to a writable memory disk /var and a default recovery configuration on an OS image /cfg partition. The upgrade procedure will be modified to include creation of zfs snapshots for /cfg and /var so that they can be updated along with the OS, but also rolled-back in case of failure. I think FreeNAS 8 comes very close to doing what I intend to do, but but its focus is heavily on being a NAS appliance and not as much on being a remotely managed general purpose server. I'll probably pare down the FreeNAS nanoBSD config file as a starting point and add in my particular customizations. It turns out we don't need zpool.cache at all. It is just as safe to import the zpools we know about on boot. Rather than play games to keep this file happy, we should just do the import always. Email with pjd@ confirms that unless we're booting from ZFS, this file is completely optional and won't really buy us anything since we have another database of zpool data. We should modify the zpool commands to operate on /etc/zpool.cache and not worry about it from there. This property can be set early in boot so we don't need to modify our backend, I believe. I'll investigate and add the appropriate early boot commands (as well as adding the zpool imports to ix-fstab). This will be more robust anyway and a lot easier to implement than the mount -uw / dancing. And that's about it for my research and brainstorming. I'm going to take a couple stabs at actually implementing these ideas and hopefully post some successful results soon. I would encourage others to give it a shot as well. Even though it's supposedly targeted towards junior admins, even developers and senior admins will probably find aspects of it challenging. In the course of study, I discovered some new tools and better ways of doing the same job I've been doing for the last decade. The exam lived up to most of its promises–the questions were straight-forward and clearly worded and it definitely separates those with real-world experience from those without. Beware Linux admins — the BSDA exam has some Linux-y wrong answers so you'd better be sure of the differences in BSD before attempting it. For FreeBSD admins, a little bit of exposure to the other BSDs is a must, especially the installers, pkgsrc, and upgrade procedures. I don't think I could have passed without having installed each operating system a couple times and learned some of the basic differences between them and FreeBSD. That's not to say that I had to become an expert in those operating systems, however–I think it's sufficient to just be aware of what's different and what what those different things are called. I almost skipped BSDA entirely because I felt BSDP would be more appropriate and I was holding out for that exam. In point of fact, there are relatively few BSDA certificate holders out there and so it is still a relatively exclusive club. There are no BSDA boot-camps or leaked questions from the exams and the exam itself is psychometrically valid, so I think it's a good goal for BSD administrators looking to validate their abilities and experience. It's a good run-up to the upcoming BSDP exam, which I think will in some ways be easier than BSDA since it will be less broad and more focused on specific real-world tasks. One thing that keeps surprising me is that out of the huge number of people who registered IDs to be able to sign up for exams, only a very small fraction have actually followed-through and attempted the exam. What's holding people back? The exam is cheap enough that it's practically free, it's challenging and exclusive enough that it's a worthwhile goal, and the inconvenience of taking it at a convention is offset by the positive experience of meeting and interfacing with other working professionals. Certification doesn't matter in my workplace, but I'm still proud to be certified. I'm proud to have an outside group validate my own personal achievement, I'm proud to be doing my part to advocate BSD and promote BSD awareness, and I'm proud to be doing my small part to support certification–especially for my fellow admins in other countries (and now even here, too), where jobs and education are scarce and any kind of professional training or certification can give them a leg-up. I don't even know where to begin. PC-BSD is making amazing progress at bringing BSD to the desktop. PC-BSD's pc-sysinstall and PBI system are also making waves in the BSD community. I think these are both going to find their way into FreeBSD eventually. PC-BSD will soon give you a choice between KDE, Gnome, and Xfce during installation. This is staus:done, it's just waiting for the next release. There are improvements to the intstaller gui, making some of the choices and defaults more sane and generally easier for people to use. The next generation PBI system will support digital signatures and decrease bloat by detecting the presense of common (meaning shared by more than one program) dependencies and hardlinking instead of duplicating them. With any luck, FreeNAS will soon split into a new, generic appliance framework and a NAS implementation. I know, you weren't at the conference, so what does that mean? FreeNAS is moving away from its roots in PHP and m0n0wall and towards a flexible appliance with configurable, modular behavior based on django apps. Ideally this django box would provide developers with a framework for creating web-managed network appliances such as NAS, firewalls, media servers, mail toasters, or whatever you want. It's hard to describe what the Kane-box is because there's not much like it on the market. The website does not do it justice. The Kane-box is a network security appliance that uses "Why the ! @# didn't I think of that!?" technology to identify and defend against malicious network traffic. Current IDS systems use attack fingerprints to detect known attacks. The kane-box is more flexible, using Bayesian filters to probabilistically classify network traffic and separate the good from the bad. The attack fingerprint may change, but the filters will still correctly identify the attack. All of this runs under OpenBSD on a custom motherboard. It's fully open-source and priced at just under $200 for the SOHO version and $850 to $1450 for the rackmount versions. newLISP is a LISP-like scripting language for doing things you typically do with scripting languages: programming for the internet, system administration, text processing, gluing other programs together, etc. newLISP is a scripting LISP for people who are fascinated by LISP's beauty and power of expression, but who need it stripped down to easy-to-learn essentials. Kane-box is built with newLISP, a powerful network scripting language that allows you to quickly and abstractly construct and analyze network packets. Wait, what was that? It's easy to miss the subtle significance of that statement: newLISP allows you to create raw packets for penetration testing just by calling a function with a few arguments. It's a programming language with networking built-in and NOT included as a library. This saves you time by letting you stop copy/pasting your basic network code. Keep it simple and be DRY. Well I was the only person to take the BSDA exam at MeetBSD. Sure enough, there actually is a non-disclosure agreement that prevents me from talking about the exam questions. My lab experience with NetBSD and OpenBSD was very helpful, though. I had planned to practice playing with package systems and building kernels before the exam, but somehow procrastinated until it was too late. That was a mistake–the experience in those areas would have paid off. They say that the BSDA exam is broad, and they are right. It's VERY broad. Unless you're in the habit of using all four of these operating sysems daily, there's probably a good chunk of questions on the exam covering commands or issues you've never had to deal with. This is in stark contrast with the BSDP hands-on, where the focus will be on the results and not the implementation. For BSDA, anyway, one needs to venture outside one's comfort zone a little and get some practice with the OTHER utilities that do the same thing your favorite ones do, just with a completely different syntax. A good point was raised yesterday about BSD certification in general. Right now the actual number of people who have taken the exam is quite low–an order of magnitude less than the number of people who expressed interest in taking the exam. There are many people in the BSD community who might be interested in the BSD certification initiative, but can't find a reason to take the exams themselves. If nothing else, do realize that taking the exam supports the BSD community directly. The exam is not about profit–the fees go to cover the costs of creating and proctoring the exams. The more people who take the exam, the more momentum in builds and the more it gets awareness of BSD out there. Even if you think it is beneath your abilities or irrelevant to the work you do with BSD, getting certified and telling people (bosses and vendors) about it helps the other certificate holders and shows the world that BSD is niether dead nor an academic playtoy. The question pool is a closely guarded secret so you can't go to a bootcamp and memorize the answers. At this stage, the only way to know the correct answers is to actually have experience performing the tasks listed in the exam objectives. There is some trivia about the different ways of doing things in the various *BSDs, but the exam itself is not silly trivia. Even though the BSDA is claimed to be targeted at junior admins with 6 months of experience, I personally think that may be a stretch. Don't let those words fool you–the BSDA exam is broad and comprehensive and I am almost sure an old dog can be taught new tricks whilst preparing for it. Learn the release location and naming/numbering scheme used by FreeBSD, OpenBSD, DragonflyBSD, and NetBSD. Download the latest release install ISOs for each operating system. Practice installing each operating system to real hardware or a virtual machine to gain familiarity with the different installers. End with working installations of each operating system to use for further practice. These objectives may be simple, but they are important. The result of today's lab will form the basis of all future labs, so it deserves some time. It will also take some time to download the four install images. There are different branches for each major, minor, and development versions. The important concepts here are the differences between a RELEASE, STABLE, and CURRENT. Briefly, CURRENT is the unstable, cutting-edge development branch that should usually not be used in production. STABLE is the active development branch associated with the current official release. STABLE is suitable for production environments that want the most up-to-date features, bugfixes, and security fixes. Every now and then, a STABLE snapshot becomes a minor RELEASE. A RELEASE is immutable except for security updates. Know that the latest release is 8.1 and that 9.0 is being worked on in -CURRENT. NetBSD also has a -CURRENT branch with the latest unstable development code. Formal Releases are intended for production use and are updated with security and bug fixes. Both release 4 and release 5 are currently supported, with the latest release being NetBSD-5.0.2. As usual, CURRENT is unsuitable for production and STABLE tracks the latest features and fixes. The latest release of OpenBSD is 4.7, with 4.8 coming out in a matter of weeks. DragonflyBSD has -DEVELOPMENT and -RELEASE branches which are similar to CURRENT and STABLE in other BSD operating systems. The current release is DragonflyBSD-2.6.3. We can follow the download links right off the main page to an FTP ISO mirror. Remembering that the latest release is 5.0.2, there are countless files listed on the FTP site: 2 for every architecture supported. I'm going to get the i386cd-5.0.2.iso image. OpenBSD has boot-only ISOs for network installs and full-install CD ISO images for networkless installs. The only way to get the precompiled binaries is to order the official CD set. I'm going to download the install47.iso image from the /pub/OpenBSD/4.7/i386/ directory of a mirror. DragonflyBSD make it very easy to choose a download. I'm going to get the i386 CD file from http://www.dragonflybsd.org/download/ and then extract dfly-i386-2.6.3_REL.iso from it. I don't want to mess with a quad-boot system, four real computers, or swapping 4 drives in and out of a single computer. I'm going to save myself a little time and space by creating 4 separate virtual machines in VirtualBox. I'm not going to cover the details of that here. There must be a dozen how-to's that cover this topic thoroughly already. You may experience kernel panics with installing FreeBSD. If so, change your virtual hard drive controller from IDE to SATA and the problems will go away. VirtualBox and OpenBSD do not get along well. Try changing the OS Type in VirtualBox to "FreeBSD" when installing OpenBSD. The segfaults tend to go away once you get the OS installed. Use "FreeBSD" as the OS Type for DragonflyBSD. At the installer boot menu, choose option 6: Boot DragonFly Without AHCI Driver. 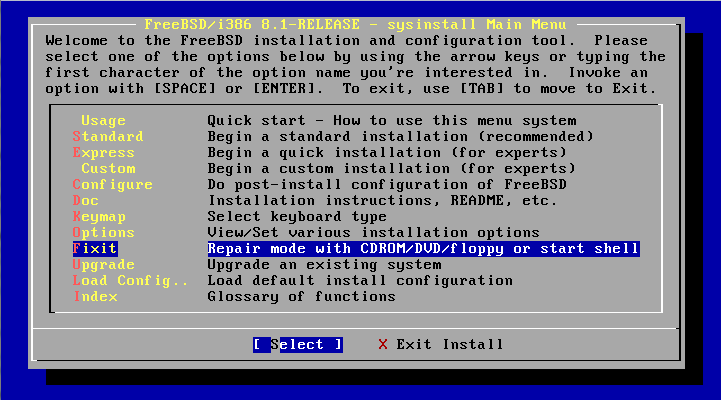 FreeBSD uses a text menu-based installer called sysinstall. Follow the installation guide in the handbook: http://www.freebsd.org/doc/handbook/install-start.html Be sure to click the "Next" links on the handbook website and read the extensive pages documenting the various menu sections of sysinstall. Don't skip the post-install section, these steps are relevant to the BSDA exam as well. A BSDA candidate should be familiar with the different installation methods, the options presented once the installer is started (Install/Upgrade/Shell), and setting up disks using fdisk(8) and disklabel(8). The candidate should also know the different installation sets to be installed and what each one adds to the system, how to merge changes in case of update. After the first reboot the BSDA applicant should be able to add and delete users and groups, to add and remove packages and to secure the system. These points will be discussed in greater depth later in the book. We'll learn the user and package management another day. For now, let's just focus on getting all the operating systems installed and get comfortable with the different installers. 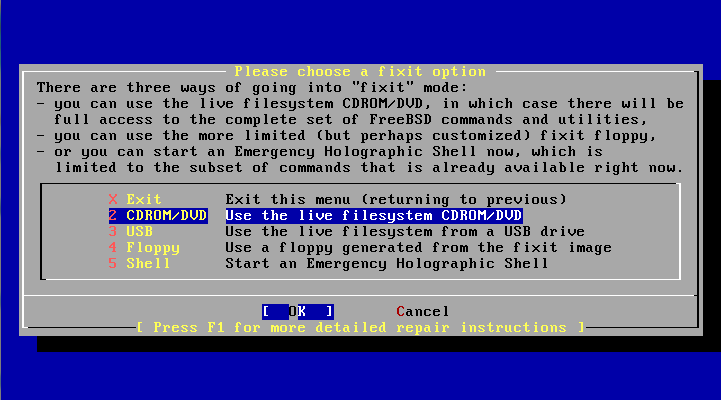 DragonflyBSD uses the BSD Installer. It's a fairly simple and lightweight text menu-based installer. Follow the short instructions here: http://www.dragonflybsd.org/docs/newhandbook/Installation/ and you should be done in no time. Although "Install four operating systems" sounds like simple task to devote a whole day to, there's actually quite a lot of ground to cover. Spend some time on each BSD's home page and try to remember what the current stable version is for each operating system. It wouldn't hurt to practice navigating to the correct download location for each release ISO a couple of times, too. I don't think it's enough to simply get each of these operating systems installed once and then move on. I would run through the full process of booting the install media and installing each OS several times until it starts to feel like second nature. I don't know about you, but my personal objective is to really understand what I'm doing and feel comfortable should I ever have to do this again in the future. The whole point of the BSD certs is to demonstrate real, practical knowledge and not to braindump in the style of bootcamp training. The recent announcement about the completion of the BSDP certification requirements got me thinking about the BSD certification effort again. It's been over a year since the last time I gave it any attention but I looks to have taken off. The BSDA exam has been going since 2008 and the BSDP exam is going to be available sometime in 2011. I decided to give BSDA a shot next month at MeetBSD California. I've been having a hard time figuring out just what to expect and how to go about preparing, though. It's almost as if everybody who's ever taken the exam had to sign an NDA promising never to describe the exam process publicly. There's no "official" courseware, but we do have the certification requirements and a wiki. There's also this nice rendition of the wiki content. The BSDA exam is a written exam without a hands-on portion. The questions are multiple choice or true/false and there should be roughly 100 questions. There may be additional questions on the exam used for the psychometric feedback loop but that don't count towards your final score. The exam is not simply graded correct/incorrect and assigned a percentage score. It is sent off to be statistically analyzed with batches of other exams. Scores will range from 200 to 700, with 500 marking the pass/fail threshold. The exam covers FreeBSD, NetBSD, OpenBSD, and DragonflyBSD. The BSDP exam will be both written and hands-on via a virtualized lab. While the BSDA exam requires a general knowledge of the basics of installing and administering 4 operating systems, the BSDP hands-on portion will require deep knowledge of at least one of them. At this time, details of the exam are still emerging. The exam fee is a modest $75. In order to take the exam, you must first register for a free BSDCG ID, register for an exam session, and pay the fee online before taking the exam. All of these steps are done over at http://www.bsdcertification.org/. Apparently some people have shown up to take the exam without having paid in advance. If you have the cash on hand, you may be able to still take the exam, but it's better to do it right and pay online in advance. I suspect many people will have some experience in one or two of the 4 main BSD operating systems, but not all. There will likely be questions testing some of the differences between these 4, so it would be a very good idea to get a copy of each OS (or get the official BSDA DVD for $40 which has them all) and practice installing them to real hardware or in a virtual machine (qemu, vmware, virtualbox, etc). Areas to focus on are the different installers, source and binary packaging systems, different firewall systems, and nuances in network configuration. You should also know the release locations and numbering/naming schemes used by each operating system. I'm most familiar with FreeBSD. I'm going to have to put in a little effort to familiarize myself with the other *BSD's on the exam, and as I do, I plan to chronicle my efforts here in the hopes that it may be useful to somebody else.